[To view the article as appearing in the Prophecy in the News Magazine, click on the link following.] 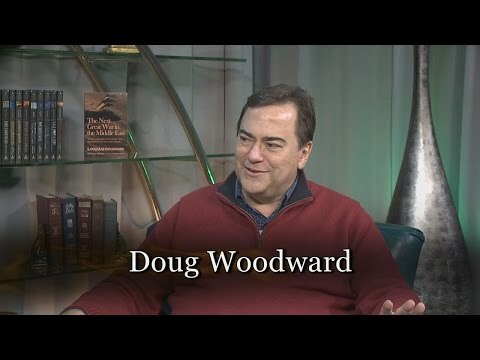 When Prophecy Fails – Woodward. Click on Browser Left Arrow to Return to FH.com. 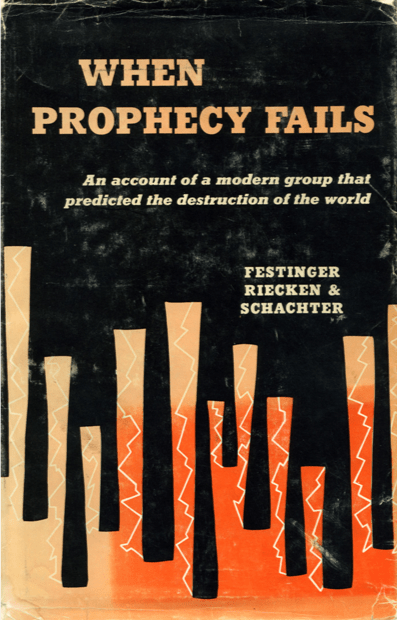 Leon Festinger published a landmark book in sociology, When Prophecy Fails, in January 1956. The book tells the story of a doomsday cult and what happens to the members of a cult when time and again its predictions failed to materialize. The main character in the book was Marian Keech (whose real-life name was Dorothy Martin, 1900-1992). Like most other doomsday cults, members joined the cult after leaving jobs, families, and fortunes behind. Its members believed that they were chosen ones. Extraterrestrials were coming in their flying saucers to save them (this cult leaped to life in the midst of the first flying saucer craze of the early 1950s). UFOs would soon land and remove the followers of the cult before a predicted great flood came to destroy the entire earth and its population. Like many cults, their “mediums” fell into a trance to tell the group what was soon to happen. The cult members grew “brainwashed” by fear. 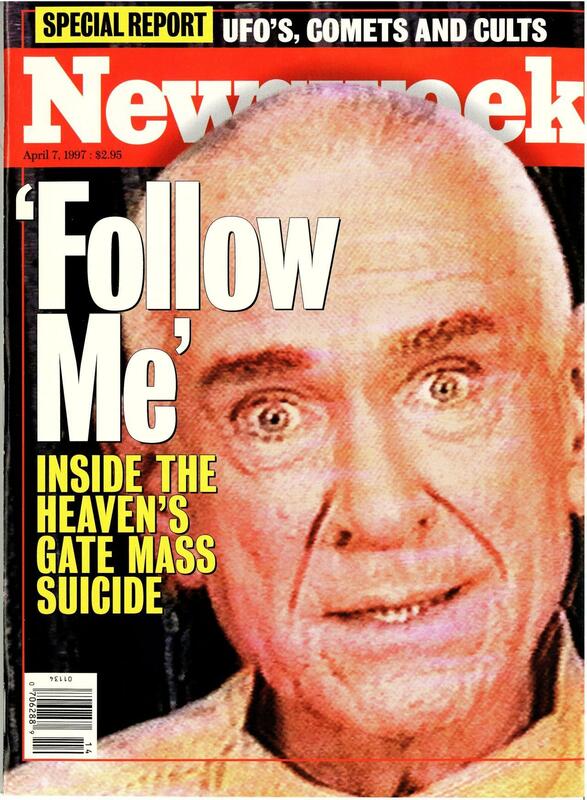 Convinced that they lived in the very last days, the cult members sold everything and moved into a commune, just as members of the Heaven’s Gate cult would do four decades later. If they were to escape with their lives, adherents believed they must follow prescribed requirements meticulously – religiously – lest they be left behind. Festinger and his team infiltrated the cult to record the sociology of the group – specifically what happened when “the prophecy failed.” The belief system the cult professed was incidental to the study, but it is noteworthy today that the cult grew out of the teachings of L. Ron Hubbard, specifically through his teachings in Dianectics. 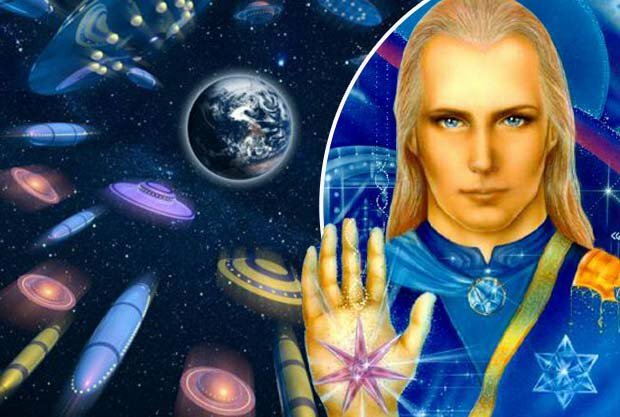 Like Scientology (and to a lesser extent, Mormonism), the religious beliefs they professed were built upon ufology and the notion that extraterrestrials sought to save humanity from its self-destructive, warring ways. 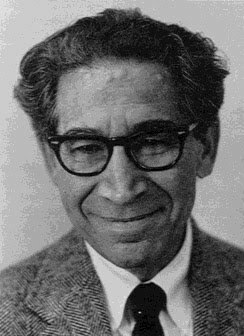 Festinger’s labeled his famous finding, “cognitive dissonance,” which, of course, has worked its way into accepted modern vernacular. The essence of cognitive dissonance is the desire to collect confirming data to offset facts that challenge one’s beliefs. In this case, cognitive dissonance led the cult’s adherents to proselytize new members, to admit them into the group so existing members could better overcome their doubts when a prophecy failed. As new members came on board, old believers’ faith strengthened – their doubts dissipated. In effect, they overcame cognitive dissonance by convincing others to believe in the doctrine of the cult. The members of the group reinforced one another’s beliefs even when empirical evidence opposed what they held to be true. Those of us who are interested in observing the fulfillment of biblical prophecy (and the jolt when a predicted outcome fails to happen) can understand the dynamic talked about in this book. However, my interest in “when prophecy fails” isn’t the mechanism of how faith falters or how it is “made surer.” Rather, it is the nature of true prophetic utterance and why it is, or isn’t, relevant to our current cultural circumstances. If prophecy isn’t speaking to the great issues of our day, it isn’t relevant and it fails to satisfy a necessary criterion of biblical prophecy. So, when is Bible prophecy relevant? My perspective is that it matters most when it confronts contemporary sin, injustice, and decadence. Warnings of judgment and assertions of conviction stand out as true marks of biblical prophecy. When the Word of the Lord comes to the prophet, he speaks the Word in such a way that it sears the conscience of the person to whom the prophecy is addressed. That is, prophecy stands out as much more than a mere academic exercise. 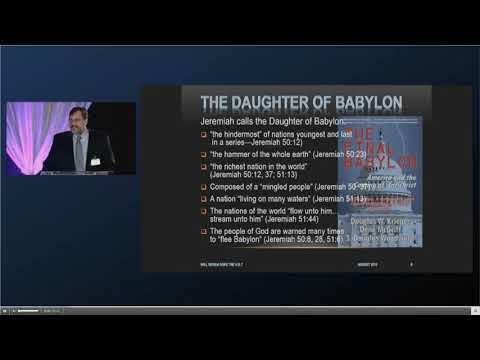 Biblical prophecy isn’t just a description of a future scenario of upcoming events. It isn’t just conjecture of happenings that will occur sometime soon. Instead, prophetic statements in the Word of God are given in the context of judgment, of cause and effect, of behavior and consequence. There is a strong moral conviction that comprises an essential element in true prophetic pronouncements. Even when Bible prophecy appears to be predicting future events that will become history (take Daniel’s interpretation of Nebuchadnezzar’s dream in Daniel 2), it conveys that kingdoms will rise and fall in no small part to the providence of God and his verdict on the political performance of the King and his personal attitude toward the LORD God. Indeed, more often than not, the words of the prophet are unwelcome. Prophets are condemned by the authorities (generally kings or queens) who do not appreciate the rebuke or worse, the prediction of death and destruction that will result if “the royal one” chooses not to heed what the prophet asserts he/she must do. Unless that king or queen changes their ways, destruction awaits. For these reasons, my admonition is that the teaching and discussion of Bible prophecy must be carried out mindful of the following: that if there is no warning supplied, no consequence detailed, no identification made of personal or corporate evil, or no disclosure of moral sin or ethical injustice, the prophetic impulse has been, at best, eviscerated; and at worst, eliminated. Consequently, I fear debates over the prophetic interpretation of scripture can become unproductive and ultimately detrimental if it does not convict any party of sin, if it provokes no sorrow, if parties addressed by it remain oblivious to rebellion, and accomplish no repentance. If speculative “scenarios,” cannot be connected to the world events we witness, I venture our conjecture is devoid of value that Holy Scripture intends. The Word of God stands to judge our thoughts and actions as they play out in our conduct and impact on our brethren. It does not serve to confirm our prophetic speculation as if seeing the fulfillment of prophecy (according to that scenario) was merely to confirm our faith. 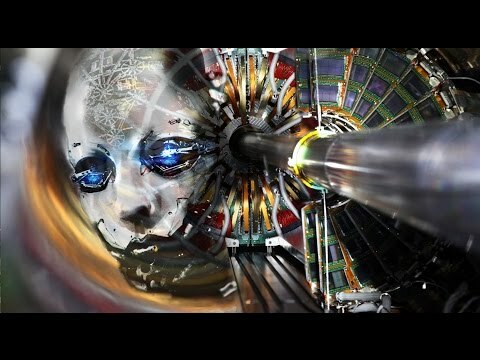 We witnessed a major disconfirmation this past September 23, 2017, when expectations were raised to a very high level based upon speculation that the sign in the heavens (which seemingly fulfilled Revelation 12:1-5), and the particular predicted events (i.e., the rapture of the Church) did not come to pass. “Prophecy failed” at that time, but the real failure related to a lack of societal repentance in the United States and limited focus on personal sanctification by the Church of Jesus Christ. This is not to say that the discussion of prophetic portions of scripture must only be presented in sermons directed at sinners. But it is to hold up a standard that demands we test the truthfulness of prophecy based upon its relevance to the world in which we now live. In other words, if prophetic discourse does not convict the guilty parties that are presently trampling the Word of God in the dust by their willful rejection of God, we must question whether such prophecy talk is truly prophetic. We must question the relevance of such prophetic discourse that keeps culpability at arms distance, that ignores global activities as well as policies we know fly in the face of God’s will. We must state that such speculation fails to live up to the standard of biblical prophecy. If the prophetic assertions we are discussing do not address and condemn the evil right in front of us, prophecy is metaphorically, if not literally, failing. Once again, allow me to clarify that Bible prophecy fails when it is not relevant to the world in which we live. We can go so far to say that prophetic statements that are not relevant to our experience are, by definition, not prophetic statements. For Bible prophecy to be prophetic, it must look today’s evil square in the face and call it out. Prophetic discourse that doesn’t question the status quo, that only considers what might happen, how it might happen, and when it might happen without dealing with the evil that suffuses it “in the here and now” (hic et nunc as theologians say), only masquerades as prophecy. We must not kid ourselves. 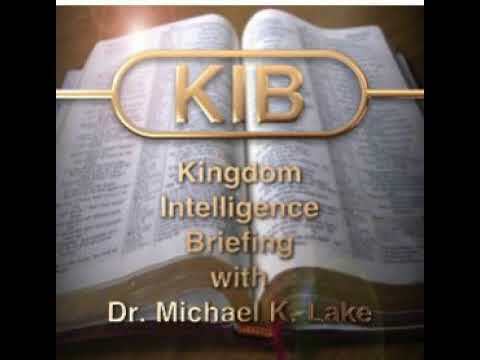 Bible prophecy challenges the powers that be. To be relevant, like the biblical prophets of old, we must assess what is happening and call into question the treachery, deceit, and deception that is poisoning our culture and society, that is unwittingly enslaving individuals, and leading our nation to judgment. That is a description of the present-day situation in our land. May we discern what the Spirit would have us preach to our culture and grant us the courage. America is in need of repentance. Evil has led us for too long. There is a chance today to see the detrimental actions of the past rolled back. Let us pray that we will see that change in the vital days ahead. While we keep looking up, let’s keep looking around to see where we are needed in the fight! The Lord calls us to give our witness courageously and to prophesy clearly. Maranatha! 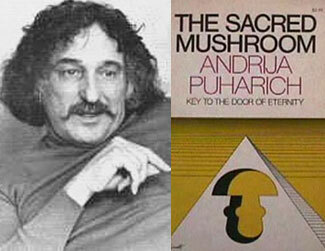 I have written about The Nine, Andrija Puharich, and the Martins in my book, Power Quest Book 2. See also Peter Levenda, Sinister Forces: Book One – The Nine. Click on the image of the book below to link to the book at Amazon.com.